In the following story, I have taken a degree of writer’s privilege, adding specific details that may or may not be true. In fact, I am pretty sure they are not true, seeing how I was only 5 or 6 years old. Who can really remember specific details from that age? So, please, just go with it… Thanks. The early morning Idaho cold bit hard at my tender face as my oldest brother, RC and I made that walk to the barn. Two more hours before sunup, but the yard light from a high pole illuminated the way. Once inside the barn, there came some relief from the cold; at least there was no wind. I was young maybe 6 years old, and I remember that walk seemed to so long. I worked my way from cow to cow doing my best to break off the dried cow dung from the teats while RC started the milking. This memory I am sure would be long forgotten except for what was soon to happen. A memory is interesting that way. The regular mundane elements of life slip seamlessly out of the memory banks. Does it not take something out of the ordinary, something painful or shocking to keep a memory attached to those crooked lines within our brains? 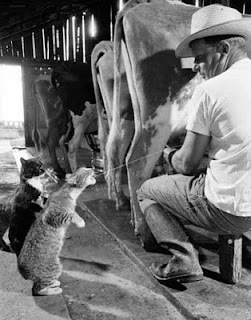 Most farms have their fair share of barn cats, and when the milking begins they start showing up. If this did not actually happen on this particular morning it certainly did several other mornings, and it was a sheer delight for a six year old boy to watch. One gray cat began her begging mew. And my brother while doing a cleaning of Nancy’s utters, squirted that cat right in the face with milk straight from the teat. That cat could lick milk off her face mighty fast. In seconds there were one or two other cats at the ready to step in and help with the cleaning. When my brother stopped the milk bath the cat’s expression seemed to say, more, more. With the game over, Nancy was soon milked and I needed to be quick because it was Horrible Sally who would be coming to take her place. Even as a youngster I was amazed how those cows knew which stall was theirs. A coffee can of grain for each, my brother yelling at me to hurry up. No sooner had I dumped the grain in the trough, and here came Sally. I jumped out of her way real quick like, saving my own life. You think I’m exaggerating? Just wait you will see Sally was just plain mean. Wiping the sweat from my upper lip before it froze; I now had the task of cleaning off Horrible S A L L Y ‘ S utters – Yikes! First off why would a six year old be expected to clean a cows utters? Think about it, how good of a job can a six year old do? Well, maybe I was in training. Right off, Horrible Sally tried to kick me when I went to touch her utters. I was expecting it, and to my credit I was quick as a gun fighter getting out of her way. Hah! That gun fighter business I had practiced often, so I am sure the learned quickness is what saved me. Horrible Sally did not give up easily and she was determined to not be denied her evil way. She must have known my toes were already totally numb from that cold winter morning and decided to do something a youngster would not really be expecting. Horrible Sally placed her right rear foot square on top of my small size 1 foot. Okay I don’t know if it was a size 1 – do you really care? I needed a size for the story – stop bugging me! And, yes it hurt. I let out a holler that seemed to make old Sally smile. She looked back at my tear filled eyes and said to herself, I wonder how the little brat would like my full weight, and she gave it to me full out. My brother soon determined my anguish and pushed, then pulled and eventually grabbed stubborn Sally’s tail and threw his full 120 pound force against her 1400 pounds. Finally he freed me and Sally looked over and smiled – I win you lose. Well, my little foot hurt while I half hopped and half crawled looking for my revenge. I saw it in the corner, there was with four nice sharp prongs. RC caught me before I could impale the beast. Sally smiled – I win you lose. I know this story is a little anti-climatic but seriously what did you expect. It came from the life of a six year old – Duuuuuhhhh!!! Thank you very muuuch! Is there a lesson here? Absolutely! Why wouldn’t there be? The lesson is obvious - do not ever name your daughter Sally. Could see it very clearly with your description and could almost feel the pain of a smuched, frozen foot. I agree, she knew exactly what she was doing :) Lovely job you had. I smiled and grimaced in turns while reading this post. Cows are plain mean...I find them pretty scary..The way they chew slowly and look at us thoughtfully with those beady eyes...As if saying "Look, I smell and I don't give a damn. You wanna piece of me???" n sally sure is horrible...i wanted 2 say something sarcastic n mean (like i normally do), but can't think of anything...maybe its coz its 1am n i'm almost asleep! I'm just glad the cow wasn't named Horrible Pat. We both know that would have made the story unbelievable. Anita: I am happy you enjoyed the piece and got a laugh. Arkansas Patti: Some jobs are better than others - you would know that! Thanks for the kind words. Hilary: Oh, you are a quick one. And, you never disappoint with your wit. Thanks for stopping by. Choco: You are getting a kitten? What about reopening your blog, for a name the cat/kitten contest. Blunt Edges: Being almost sleepy is a whole lot better than being almost old and being old is a whole lot better than being almost dead. I am a bit disappointed in your lack luster comment. No dripping sarcasm or smirking off handed nonsense. Yes – a huge disappointment. Dianne: Oh, Dianne, Dianne, Dianne…what is this kicking me in the head thing? Are you saying I am stupid…don’t answer that. Are you saying I am a few udders short of a full bag? Don’t answer that either. Are you saying that dent in the side of my head is in the shape of a hoof? Don’t answer that. Three cheers for child labor – no work, no eat. That's what I say. Pat: Certainly over the top, way out of this world, and majorly unbelievable with a cow named Horrible Pat. What about Horrible Patty? Would that sell? I hope you have a great week! Nope. Not getting any kitten. Done that and been there, more than once. My mother was forever telling me to wear my boots down at the barn. This short memory kid had on flip flops one day while washing show steers and one stepped on my foot and did a half turn for good measure. It did hurt. Learned my lesson though. Your fear is still there otherwise why would you post with many spelling errors. Guess your mind was racing when you were thinking as well as typing about that day. I tried hard to imagine the six-year old Grayquill but could not until . . . I thought of Sally kicking GQ. Everything fell into place. hahaha a great post. Loved it a lot. The line "I win you lose", instantly reminded me of the animated movie "SPIRIT". I can understand it soo well whether why you remember that incident with such a detail. Great story GQ and moral too.